This coming Monday is Earth Day and Pioneer has decided to commemorate this day of action with just a little bit of inaction (in a good way!). What could be better than walking somewhere local for a candlelight dinner made with locally sourced food inspired by local hops? Two of our favourite people have joined forces to create an Earth Day event everyone will want to attend. Anne Sorrenti, executive chef at Morgan's and Troy Burtch at Great Lakes Brewery, teamed up for Lights Out - an candlelight evening of local beer and local food. Great Lakes Brewery is Toronto's original craft brewery, and so Sorrenti has created a four-course local menu that integrates their famous ales - including dessert (think coffee and cake...mmmm). The four courses will be paired, of course, with tasters of some new brews and old classics. If you've never been to a beer dinner before, they are great fun. Tickets are a measly $50 - which is great value for a four course dinner with drinks especially from the Morgan's kitchen. Event starts at 6:30 with some apps and a pint. For more info, there are lots of options! 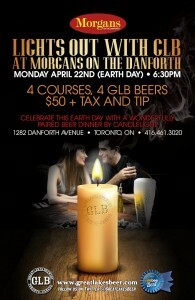 Call Morgan's and make a reservation (416 461-3020), check out details on Facebook here, or head to GLB's website here. We can send you an email when we have a new post! Email thedaily at eastendpioneer.ca with questions or neighbourhood updates.